In its ordinary series of Nobel Prize Laureates Sweden has issued on 20th March 2003 these two stamps as a joint issue with Spain. The stamps feature (left) Dr. Santiago Ramon y Cajal (1852-1934), who in 1906 was awarded the Nobel Prize in medicine together with the Italian physicist, Dr. Camillo Golgi, and (right) Dr. Severo Ochoa 1905-1993), who was awarded the prize in 1959 together with the American physicist, Dr. Arthur Kornberg. Please note the security tagging on the vertical sides of the Swedish stamps, which does not exist on the corresponding Spanish stamps. Please note also, that the Swedish stamps (in opposition to the Spanish counterpart), appear in a somewhat darker imprint. The stamps were printed in Sweden in 1-colour recess and 4-colour offset. Date of issue: 20th March 2003. Print run: no information. Size of stamp: 41,66*31,25 mm. Sweden 2003. Nobel Prize Laureates. Joint issue with Spain. Click here to see the corresponding Spanish issue. The link will open in a new window. 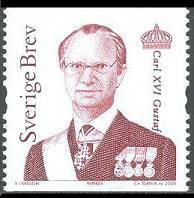 On 21st August 2003 Sweden has issued a new stamp depicting King Carl XVI Gustaf. The stamp is of the same design as the 2000-issue (see pg. 2000-2001). For this reason it is inscribed "Cz. SLANIA sc. 2000" in the lower right corner, but is rightfully issued in 2003. It is a coil stamp, perforated on the two vertical sides, with security perforation. The engraving is made after a photograph by Jonas Ekströmer. The stamp is NVI, and valid for 5,50 SEK, corresponding to 1st domestic rate in Sweden. Please note that the corresponding stamp of Queen Silvia is not engraved by Czeslaw Slania. 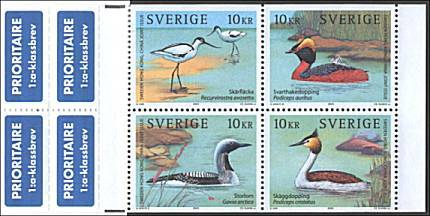 On 4th October 2003 Hong Kong and Sweden has released a joint issue showing waterbirds. The surprise about these stamps is that on the preview initially submitted by Post Sweden (shown immediately left) all the stamps had security perforations on the vertical sides, but on the final issue they all have standard perforations on three sides. The fourth side is straight cut in the usual Swedish "booklet-manner", with no upper and lower selvedge (below left). Original preview with security perforations (not valid). 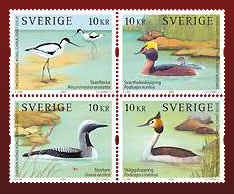 The final Swedish stamps are issued in booklets of four, together with four priority labels, as shown below right. All four stamps have the value of 10 SEK, corresponding to the first postage rate within Europe for letters up to 20 grams. 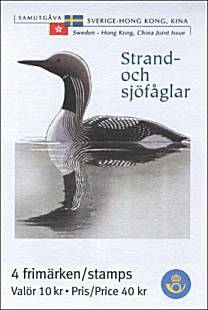 Front cover of the Swedish booklet showing a black/white print of the Arctic Loon, the Swedish flag and the Hong Kong flag. Final issue in booklet of four, with priority labels, and no security perforation. Scott # 2469. Pied avocet (Recurvirostra avosetta). Scott # 2469a. Horned grebe (Podiceps auritus). Scott # 2469b. Arctic loon (Gavia arctica). Scott # 2469c. Great crested grebe (Podiceps cristatus). Scott # 2469d. The corresponding Hong Kong issue is available here.